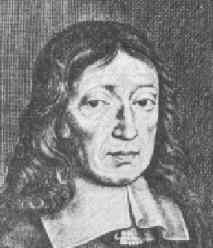 John Milton was born in London in 1608. He came from an upper middle-class family and attended Cambridge University where he studied for the ministry and first began writing poems in English, Italian and Latin. After leaving university, he decided against becoming a priest and spent the next six years at home, writing L'allegro, Il Penseroso, Comus, and Lycidas, and pursuing his study of languages. In the late 1630s he travelled in France and Italy, where he met Hugo Grotius and Galileo Galilei, with whose struggle against censorship he sympathised. Upon his return to England, the outbreak of civil war put an end to his poetic career for twenty years. Milton was a strong supporter of Cromwell and the Puritans, believing that the people had a right to depose their rulers, and published many pro-Puritan pamphlets on various issues. But the definitive time in Milton's life came in 1651, when he lost his sight and rediscovered his gift for poetry. Paradise Lost, an epic that deals with the Fall from Eden, was first issued in 1667 and remains his most enduring work. Although the merits of Milton's writing were much debated in the centuries that followed, few question his status as one of the greatest poets in the English language. He died on November 8, 1674. Assuredly we bring not innocence not the world, we bring impurity much rather: that which purifies us is trial, and trial is by what is contrary. Better to reign in hell than serve in heav'n. Give me the liberty to know, to utter, and to argue freely according to my conscience, above all liberties. How soon hath Time, the subtle thief of youth, stolen on his wing my three-and-twentieth year! So dear I love him that with him all deaths I could endure, without him live no life. Epic poem featuring Satan, Adam, and Eve, and the afterlife. Dramatization of the temptation of Christ.